Lost in the heart of the Indian Ocean, on the North-Eastern side of Madagascar, the Seychelles represent a perfect destination for a honeymoon or idyllic family vacations due to the beautiful beaches situated close to luxurious forests. By renting a villa in the Seychelles you will get your small corner of paradise. On the Praslin island, you will get the chance to relax on the beach of Anse Lazio and to bathe in the surrounding turquoise water. Concerning excursions, take the road to Mai Valley, placed in the UNESCO World Heritage for its flora richness. There you will discover the famous sea coconut tree, where the fruit, the “coco-fesse” has become the country’s emblem, not only for its shape, but also for its endemic character. 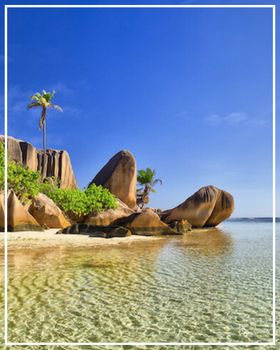 On La Digue Island, the experience is even more authentic with walks, bicycle or cart rides through the green parks, leading to a sandy beach surrounded by crystalline waters, i.e. Grand’Anse.